Belongings is an interactive installation that brings stories of displacement, resilience and hope to life in a surprisingly new way. 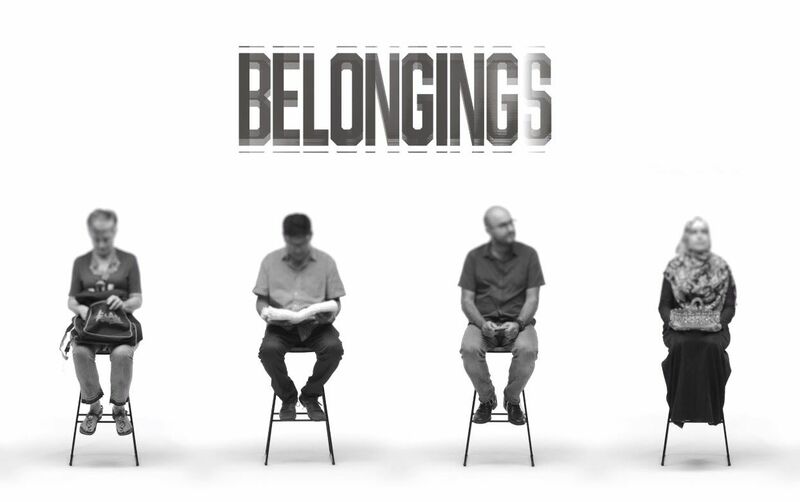 Created by SBS’ Digital Creative Labs and using technology developed by Google’s Creative Lab, Belongings was produced in partnership with the community it is about, through storytelling workshops where participants were invited to bring an object they fled their homeland with. 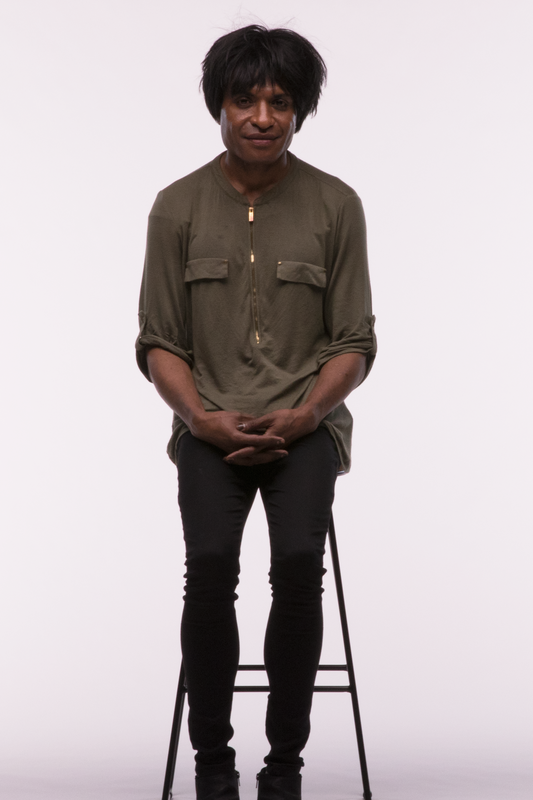 The outcome is a series of uncut stories recorded in one take that reflects the complex journeys those seeking asylum in Australia continue to face when their time in their homeland is cut short. Over the past century, lengthy and large-scale waves of human displacement have stripped millions of people of their histories and identities. The refugee crisis is a problem so pervasive and seemingly unsolvable that it has detrimentally impacted Western perceptions of the refugees themselves. In debates over border security and the allocation of tax-payers dollars, the struggles of refugees are often overlooked; discarded in a bid to protect our own prosperity and privilege. This installation, Belongings, sought to destabilise the ‘us versus them’ mentality by highlighting the universality of humanity through a single, common thread: our treasured belongings. In Australia, most of us are fortunate enough to possess objects that carry emotional or familial significance. Refugees are no different - their keepsakes represent hope, protection, love, comfort, strength and identity. They are extensions of themselves - they provide a sense of their past and tell them who they are, where they have come from and perhaps where they are going. Only, for refugees who fled their homelands with a mere handful of possessions, these belongings hold far greater significance. These objects often represent a happier time; before violence, persecution, war and loss. 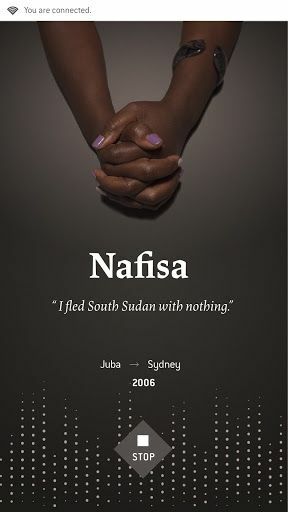 This project shares the stories and journeys of six refugees living in Australia, each told through the prism of a possession. For some, retracing their steps restores a loss of identity, and strengthens their connection to the past. For others, it provides hope, and a sense of protection from further harm. And for one, opening up reminds them of the lengths gone in seeking happiness, and strengthens their resolve to prosper. 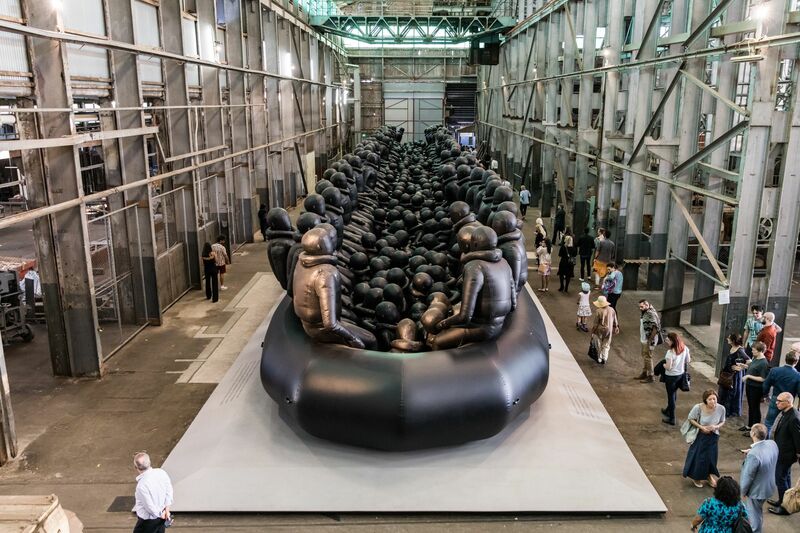 In 2018, the Biennale of Sydney - an international festival of contemporary art, held every two years - exhibited Chinese artist and activist Ai Weiwei’s artwork Law of the Journey; a giant, black inflatable life raft containing more than 250 anonymous figures, its size and construction suggest the overwhelming scale of recent refugee crises and the manner in which identities are lost and histories erased. 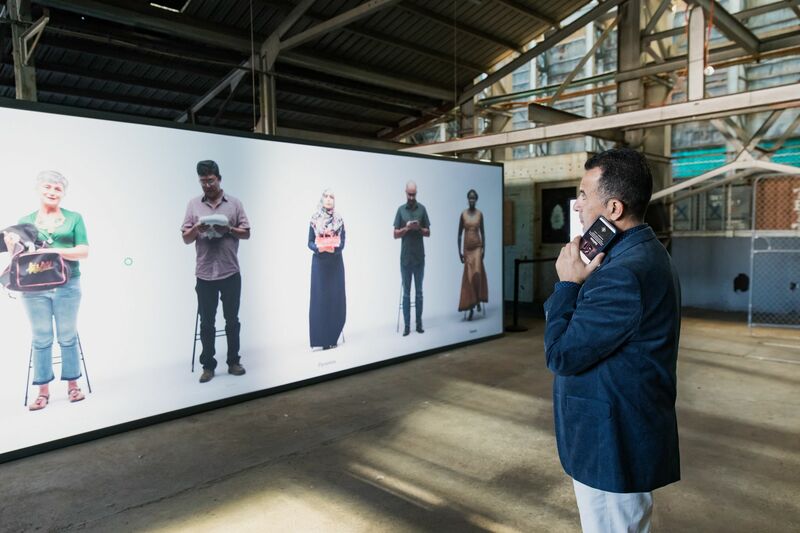 Bringing context and local voices to Weiwei’s work, SBS produced a complimentary documentary installation telling the personal stories of a handful of refugees now living in Australia. The project supported Law of the Journey’s call to action in addressing civic apathy by allowing audiences to connect with refugees in a surprisingly personal way, giving the participants a platform to express their strength and reclaim some of their identity. 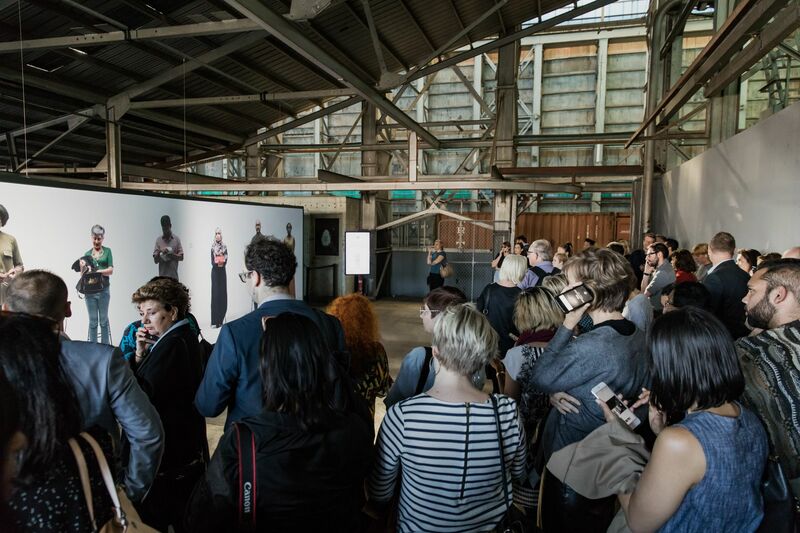 Google’s Creative Lab in Sydney presented SBS with an opportunity to implement an experimental installation system, in which the audience can consume stories in a multi user, large scale environment using their personal mobile phone as an input device. The project is multilingual, available in eight languages: English, Spanish, Arabic, Mandarin, Cantonese, Hindi, Punjabi and Vietnamese. As you approach the installation the images of six refugees are projected on 7m x 3m screen. The figures are at 1:1 human scale, standing side-by-side in front of you. They are still, though not static images; alive and breathing, waiting for you to interact with them. In the same space there is instructional signage prompting you to join a Wi-Fi network using your mobile phone. 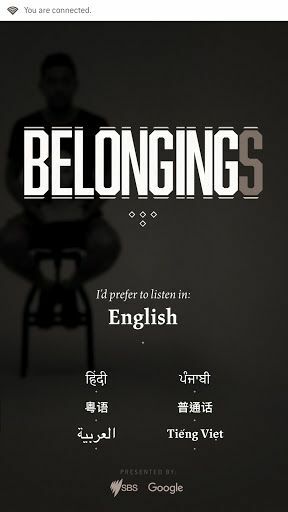 Upon joining the ‘Belongings’ Wi-Fi network, on your phone you are prompted to confirm your preferred language for the experience. 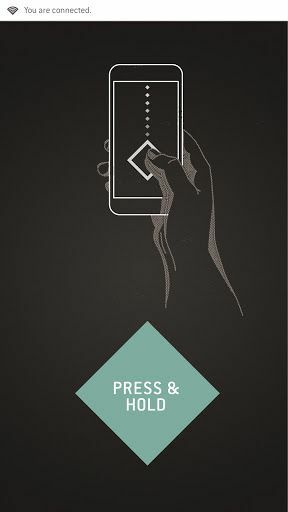 Moving your phone as a pointer device, you control a cursor on the large screen which you use to engage with one of the people in front of you. Selecting one of the contributors, their story is ‘activated’. They step forward and deliver their short testimony of their experience. The audio, which is heard in your chosen language, is streamed to your phone. The experience is multi user, where any user can ‘tune in’ to a story that may already be playing out. 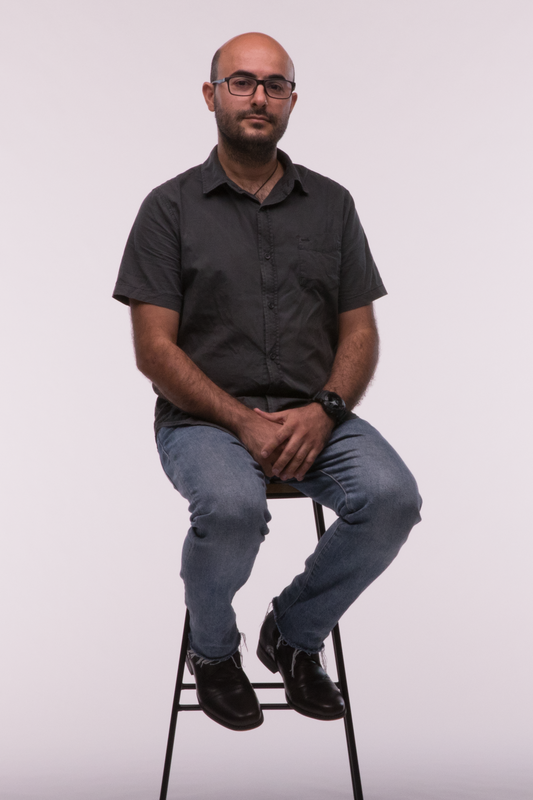 Damon Amb, 38, originally from Iran. Lizzy Samba, 34, originally from Papua New Guinea. Parastoo Bahrami, 21, originally from Afghanistan, spent 11 years in a refugee camp in Indonesia before coming to Australia. Sabina Krusevljanin, 55, originally from Bosnia Herzegovina. Amou Job, originally from South Sudan. 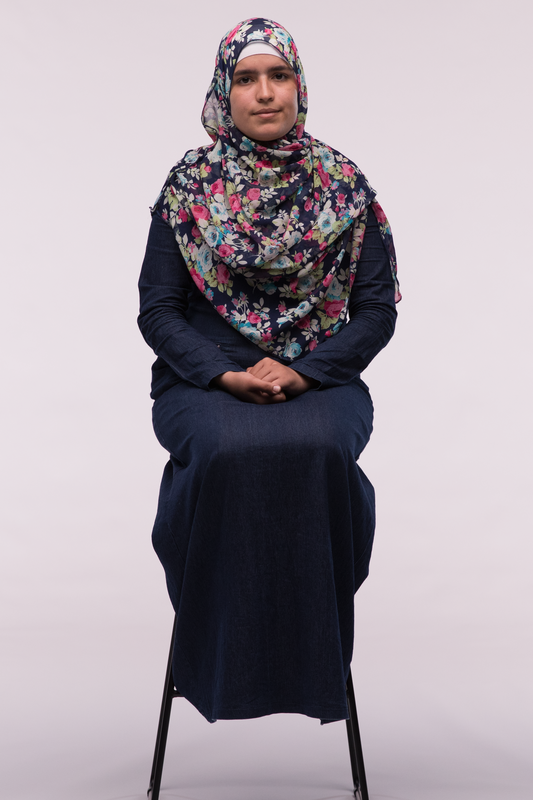 (Memories) Amou did not bring anything because as she moved from refugee camp to refugee camp, she lost everything. She has her memories and her stories. R.H. (does not want to be identified), 48, originally from Bangladesh.